Kitchens® is the fulfillment of a dream that founder Mitzie Collins had. Her idea was to bring affordable quality cookware and kitchen tools to the everyday cook. Mitzie’s love of cooking combined with the inability to find these things locally led her to create the concept of Kitchens®. She envisioned a store that sold items in smaller metropolitan areas that could be used by professional chefs and home cooks alike. So, in conjunction with her husband Jeff, the first Kitchens® store opened it’s doors in 1992 in Evansville, Indiana. One year later, with a trademark secured, a second store was opened in Davenport, Iowa. In 2001 we opened the Eden Prairie, MN location & in 2010 our Branson, MO location was opened. All offering an exceptional selection of quality cookware, unique kitchen tools, amazing utensils, which includes a knife section that offers some of the best cutting edge technology to date. Gourmet foods and freshly ground coffees are offered as well. 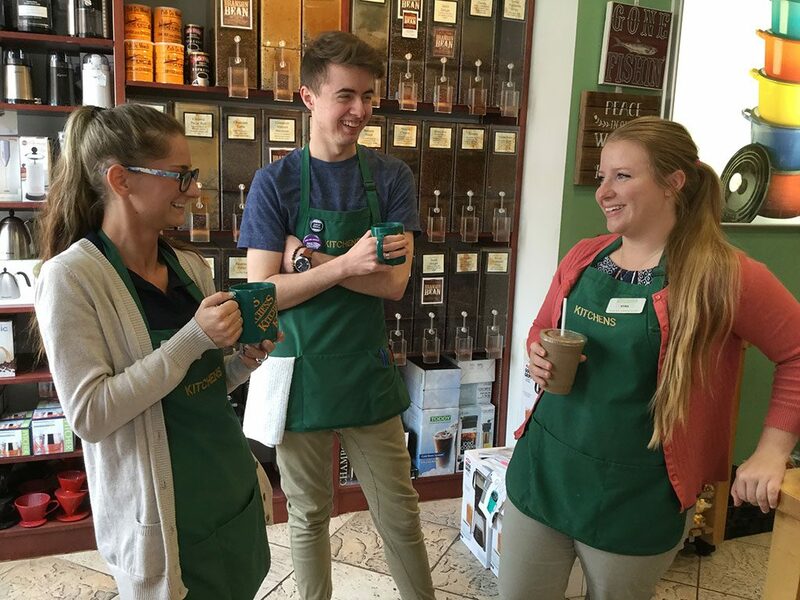 Our Davenport location has a full service coffee bar, offering a tempting array of regular and flavored coffee and teas as well as espressos, lattés, and cappuccinos. We invite you to visit Kitchens® and let our friendly, knowledgeable staff assist you with your cooking needs. Enjoy a complimentary cup of coffee while you shop and see for yourself the quality array of products we offer. We look forward to providing you with exceptional customer service on your visit. We want everyone who enters, to leave as a satisfied and valued customer. Not seeing a store near you? Click on the store page and call any one of the stores. We will be happy to help you find that special item you are looking for & we can ship to your home.